For a recent trip to Florida, I was forced to rent a car. Usually this is something I don't do, as my trips consist of me driving the entire way and having my own car. On this trip though, a plane flight was involved along with renting a car from Thrifty. First off, I will say that Thrifty was super cheap and had a few different cars to choose from when we walked to the lot. They were very disorganized though and the entire situation felt like a blur. I was offered twenty different options to add on to my rental and nobody was around to direct us to our vehicle. Either way though, we found the correct lot and were told to pick any of the following cars - Toyota Camry, 2012 Chevrolet Impala, and the 2013 Chevrolet Malibu. I really have no idea the year on the Camry, and I'm actually guessing on the Impala because it was not the new, new Impala. I decided on the Malibu. Recently it was redesigned, twice. This was the first redo for 2013 that nobody seemed to like, but at the same time people do, if that makes sense. Personally I thought it offered a huge improvement over the seventh generation in the looks department. I have never driven one so my curiosity was easily there for Gen 8. Our Malibu was pretty base and simple as most rental vehicles are. Cloth seats, the simple audio system, non-flashy color, and kind of blah wheels. With all of these negatives I listed, I still love the way the car looks. For a four door simple rental fleet sedan, the Malibu really is not that bad. The edges are kind of sharp, the quad tail lamps are neat, and the front grille looks clean. The interior was pretty nice as well. The seats seemed kind of boring and cloth, but I guess you cannot expect them to put Recaro seats in a fleet vehicle. 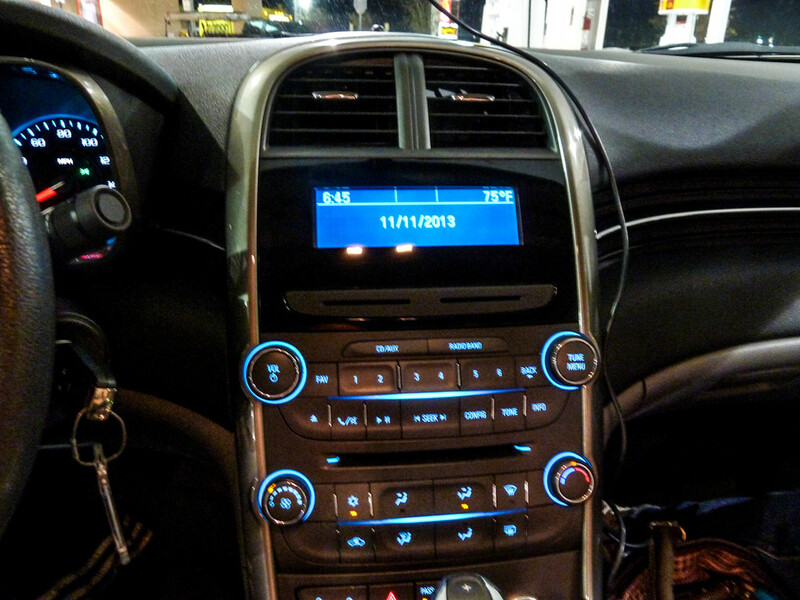 The digital radio setup was easy to use and the gauge cluster looked new and updated. The center console did a funky slide thing, which I have heard will be gone on the 2014 refresh. Finally, the only other weird thing, which will be tough to explain, is the shifter does not line up with the indicator letters. So imagine you go to pull the shifter to "D", well it goes way past "D" and is way past the "M" which is for manual mode. Now the letters do light up to indicate which you are in, but it was awkward to pull the shifter way past where it felt it should have gone. The manual mode was pretty much a joke, going into "M", then requiring you to use an awfully placed plus and minus button on top of the shifter. I hope the refresh next year addresses the small interior items that bugged me on this car. Driving it for me was pretty straight forward. It felt like a bigger car than it is. For some reason it just felt tough to maneuver. The acceleration was on par with a four cylinder, offering up close to 200hp. Six speeds in an automatic with such a small engine gives lots of shifts. They were smooth and predictable I thought. I really want to drive this car with a six cylinder. The driving would be totally different and it would have just a little more power to change lanes and get to where you are going. The trip ended with no extra charges, we filled up our tank before returning the car, and that pretty much is it. Anytime I rent a car, which isn't often, I feel the car is just getting one step closer to dying. Eventually, that Malibu will be wrecked by someone, break, wear out, or be sold at an auction for $800. For the 200 miles I used it though, it did a nice job and gave me a chance to drive a vehicle that was only available for one year... Bring on Generation Eight 2.0!